Please support county staff's recommendation for denial of this land use application for a hotel in the Reston TSA that will be coming before the Planning Commission on May 3. The staff is to be commended for enforcing County rules evenly. 1. 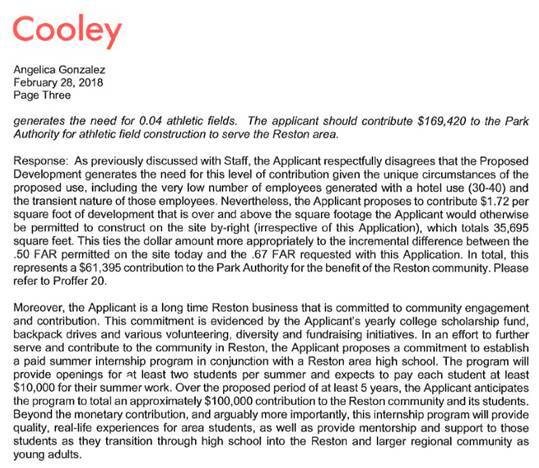 This applicant is seeking to provide less funding than is suggested for Reston athletic fields. This would result in a loss of $109,442. The applicant's justification of providing paid summer internships to high school students over 5 years equals a $100,000 contribution. Although this is a valuable benefit to students and appreciated, the $109,442 contribution to athletic fields will stay and contribute to Reston forever. The Comprehensive Plan language stating a need for the "equivalent of" 12 athletic fields is already less than County Service Level Standards based on population. Do not accept less, especially for this community founded on recreation. 2. This applicant is suggesting to pay less into the Reston Road Fund than required which would result in a loss of $632,233. Traffic is consistently brought up as a top concern of Reston citizens. Do not accept anything less than full contribution to the road fund. Residents within the TSAs and business property owners who cannot afford a large law firm to craft their exceptions are set to begin paying this tax this year. Do not set a precedent that those with big dollars can gain exemptions. If this applicant balks at contributing to its surrounding world-renown planned community and it is accepted, it sets the stage for this to occur with every forthcoming application. The end result would be a huge loss for Reston. This applicant is knowingly seeking to contribute less in two key areas. Do not accept anything less for Reston. Keep Reston as a model planned community. The plan includes athletic field and road tax contributions. Please support your county staff and deny this application. A non-profit, tax-exempt corporation, founded in 1967. RCA promotes and protects Reston's founding principles in the political arena by serving as a non-partisan forum for all residents and as an advocate for the community with County and State government.